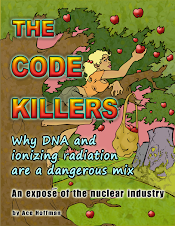 Ace Hoffman's Nuclear Failures Reports: Shocking letter from 2004 shows SoCalEd was concerned all along about ... profits! Shocking letter from 2004 shows SoCalEd was concerned all along about ... profits! If I ever actually hear that San Onofre Nuclear [Waste] Generating Station is being decommissioned, I'll start to believe that we'll soon be left with only the spent nuclear fuel problem to deal with. I haven't heard anything like that, but we definitely got one step closer to decommissioning today. Senator Barbara Boxer was calling SoCal Edison's statements "gobbledygook." Dave Freeman, former head of the federal Tennessee Valley Authority and senior advisor to Friends of the Earth says: "The San Onofre restart plan is now deader than a doornail. It's over." Damon Moglen, climate and energy director for FOE says: "The restart of San Onofre reactors is now off the table." I hope the FOE experts are right, but nobody can be sure until the decommissioning begins, and even if they are right, we still have a pile of deadly nuclear waste to deal with. It's "just" not getting any bigger right now and if there's no restart, it won't get any bigger ever again. Also, as it ages, the spent nuclear fuel becomes somewhat easier to handle, although it will remain very difficult and dangerous to deal with for hundreds of thousands of years. SoCalEdison had always planned to walk away from the problem of what to do with the waste. It was always just a question of when they would walk away from the mess they had made. It's still possible that somewhere at SCE, some Vice President is writing a letter just like the one uncovered today from November 30th, 2004, which clearly says the steam generators are obviously not going to be "like-for-like." It also clearly states that performance is as critical as timing -- the replacement steam generators were expected to perform at 106% of their original reactor thermal power capabilities, which they are now licensed for. The letter also makes it clear that the RSGs must be designed and delivered on time. To do so, a lot of corners were cut. All the recent government actions against SCE will amount to nothing but a few years' delay (at most) without decommissioning. Without decommissioning, the plant is expected to reopen eventually. But, under current federal law, if San Onofre is "decommissioned" (which means dismantled), then its license is abandoned. Currently, San Onofre Unit two can be restarted in a matter of days, if permission is granted by the NRC. The uranium-235 enriched fuel is fully loaded, the coolant loops have been sealed and resealed, and pressure tested and retested. Control room operators are ready to withdraw the control rods and resume operation. It may sound like we're close to a breakthrough because a letter was made public from nearly ten years ago, from a guy who resigned eight years ago and has "no comment" now when reporters asked. And it's good to hear a Senator condemn SCE's apparent utter disregard for the safety and welfare of the 8.7 million citizens who live within 50 miles of the plant, and the tens of millions more who live just beyond that artificial marker. But I don't hear Ted Craver saying "we are starting the decommissioning process of both units, effective immediately." To have SanO finally decommssioned would mean we would still have to figure out what to do with the waste that was already created, which is no easy task. But pretending that the waste problem can wait has been our biggest mistake so far. Meanwhile, the engineering quicksand continues to drag Edison under. One of their main reasons for assuring the public that Unit 2 is different from Unit 3, and that because of those differences Unit 2 won't suffer from fluid elastic instability like Unit 3 did, is the claim that Unit 2 has twice the contact forces of Unit 3 in the u-bend region where the steam generator tubes are butted up against the anti-vibration-bars. The problem with that claim is that industry experts -- hired by SCE -- have stated that 10 to 30 times the contact force is necessary, not just double. How many nails does SanO's coffin need? Decommission San Onofre NOW. Green jobs for all. 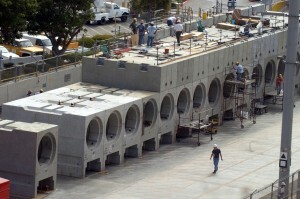 Preparing the dry cask storage site at San Onofre.